A newly discovered comet has the potential to put on a dazzling celestial display late next year, when it will be so bright you may be able to see it briefly in the daytime sky. 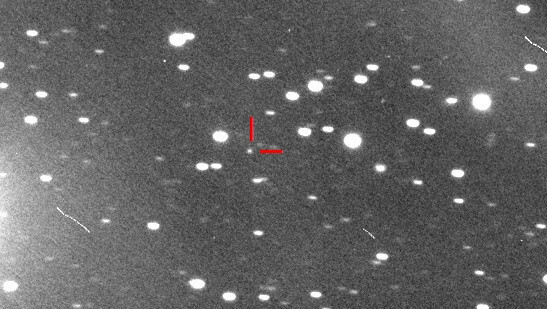 The discovery of the object named Comet ISON was announced Monday (Sept. 24) by Russians Vitali Nevski and Artyom Novichonok, who detected it in photographs taken three days earlier using a 15.7-inch (0.4-meter) reflecting telescope of the International Scientific Optical Network (ISON), near Kislovodsk. The new comet is officially known as C/2012 S1. When first sighted, Comet ISON was 625 million miles (1 billion kilometers) from Earth and 584 million miles (939 million km) from the sun, in the dim constellation of Cancer. It was shining at magnitude 18.8 on the reverse scale used by astronomers to measure the brightness of sky objects (the lower the number, the brighter the object). That makes the comet currently about 100,000 times fainter than the dimmest star that can be seen with the unaided eye. This image shows the newfound comet C/2012 (ISON) as seen by the Remanzacco Observatory in Italy. The image, taken by amateur astronomers Ernesto Guido, Giovanni Sostero and Nick Howes, is a confirmation view of the comet. 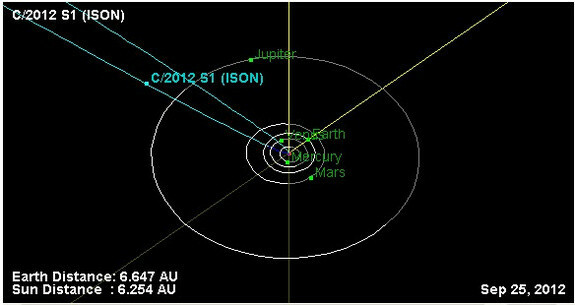 This NASA graphic shows the orbit and current position of comet C/2012 S1 (ISON). The comet is at present located at 6.25 AU from the sun, with 1 AU being the distance from Earth to the sun. Image released Sept. 24, 2012. The fact that the orbits are so similar seems to suggest Comet ISON and the Great Comet of 1680 could related or perhaps even the same object. Comet ISON will be barely visible to the unaided eye when it is in the predawn night sky, positioned against the stars of Leo in October 2013. On Oct. 16 it will be passing very near both Mars and the bright star Regulus — both can be used as benchmarks to sighting the comet. In November, it could be as bright as third-magnitude when it passes very close to the bright first-magnitude star Spica in Virgo. The few days surrounding the comet’s closest approach to the sun on Nov. 28, 2013, are likely to be most interesting. It will whirl rapidly around the sun in a hairpin-like curve and perhaps becomes a dazzlingly bright (negative-magnitude) object. The comet will then whirl north after perihelion and become visible during December both in the evening sky after sunset and in the morning sky before sunrise. Just how bright it will be and how long the tail may get during this time frame is anybody’s guess, but there is hope that it could evolve into a memorable celestial showpiece. And in case you haven’t checked your 2013 calendar, Nov. 28 is already a special day for those living in the United States: It is the Thanksgiving Day holiday. Which leads to the question: Will Comet ISON be a dazzler, or a turkey?